South Korea-based LG Display is adding some depth to its monitor lineup with a 23-inch Full HD 3D display. Details about the new product are fairly scarce, but LG does claim that its Full HD (1920-by-1080 pixel resolution) 3D display offers image quality that's almost twice as crisp as existing 3D monitors, thanks to LG's proprietary "high performance 3D exclusive controller" and "copper bus line", and the display will be able to handle both 2D and 3D images. 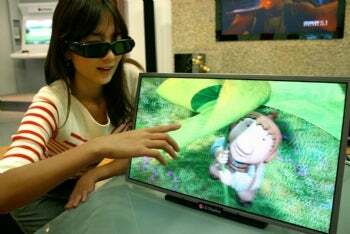 No target release date was announced, but the Korea Communications Commission announced plans to start a Full HD 3D broadcast trial service in the second half of 2010, so we'll probably see this display in the next year. Also, this display will probably require the viewers to wear shutter glasses to see the 3D image, so we can anticipate looking like extras from a low-budget science fiction movie while we're watching our brand new 3D TV. Expect this to be the first in a wave of 3D display-related announcements that will likely peak at 2010's International Consumer Electronics Show (CES). 3D display news has been trickling out for the past year (take a look at Sony's 360 3D display prototype as well as some earlier 3D consumer gear) but it wasn't until Acer's 3D laptop release in October (the Aspire 5738DG-6165) that we started seeing consumer-oriented 3D products hitting the market. Want to see what else we think is coming in CES 2010? Check out our CES Gadget Preview Slideshow as well as some CES speculation. Follow @ geektech on Twitter for more news on hardware, hacks, and cutting-edge tech, or @pattheflip for cranky tech ramblings.